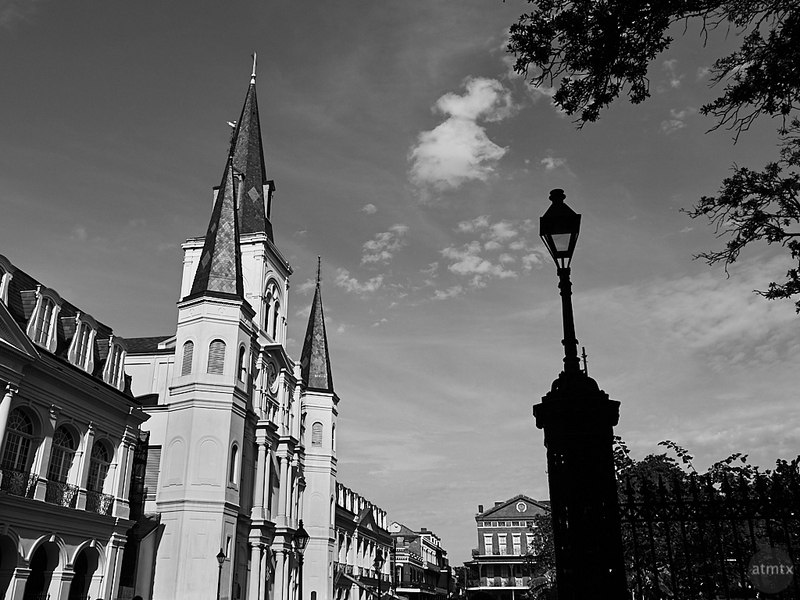 Like yesterday, here’s another unconventional view of Jackson Square. The famous St. Louis Cathedral is on the left, shot from the side, More typically, the building is shot straight on, like I did here. I was several blocks away, on a side street and the cathedral looked like an entirely different building. It wasn’t until I entered Jackson Square that I realized the different angle rendered this familiar building, unrecognizable to me. It was in this spirit that I shot the building from this odd angle. The silhouettes of the lamp and tree counter-balances the framing. However, I almost didn’t keep this photo. The color version, which I made by default with the Olympus OM-D E-M5 Mark II, just didn’t look compelling enough. Luckily, I converted to black and white, which made all the difference. Now the light colored buildings on the left are balanced nicely with the dark silhouettes on the right. It’s a different enough composition, and arguably more artistic, that I prefer it to the typical straight on view.